I decided that my holiday baking this year would be three recipes from Luisa Weiss’s Classic German Baking (Ten Speed Press, 2016) — after all, many of our holiday traditions, and a good portion of American baking more generally, come from German immigrants, which accounts in part for the wide differences between US and UK Christmas food traditions. (And, of course, my family name also comes from German immigrants!) Among the most classic German-American traditions at Christmas are pfeffernüsse, small spice cookies (often confused in appearance, but not flavor, with Russian/Italian/Mexican tea cakes/wedding cookies) flavored with ground pepper and gingerbread spice (the latter is called lebkuchengewürz in German and is a common prepared mixture of ground spices used in many recipes). I remember my father making cookies like these when I was little, probably using the recipe from the 1976 edition of Joy of Cooking . Rombauer’s Joy recipe is quite different from the recipe in Weiss’s book (pp. 228–30), and I suspect it reflects a more “Americanized” version. Among the most notable differences, Rombauer uses molasses, black pepper, baking powder, brandy, and dry confectioner’s sugar where Weiss uses honey, white pepper, ammonium carbonate (“baker’s ammonia”), rum, and a lemon-sugar glaze, respectively. The most significant difference is that the Joy recipe contains butter whereas the only fat in Weiss’s recipe comes from the egg; Joy also uses candied citron and chopped almonds, flavoring ingredients absent from the Weiss’s pfeffernüsse. (By the way, in this post I will use English capitalization since I’m writing in English, but I will follow the German morphology for number, so it’s one pfeffernuss and two pfeffernüsse.) Weiss says that her recipe comes from Offenbach — like many traditional European recipes, there is a lot of regional variation — and it’s entirely possible that Rombauer’s recipe is equally authentic but from a different part of Germany. Before starting to make the pfeffernüsse, it was necessary to gather the requisite ingredients for the lebkuchengewürz — since, unlike in Germany, it’s not something sold in grocery stores. 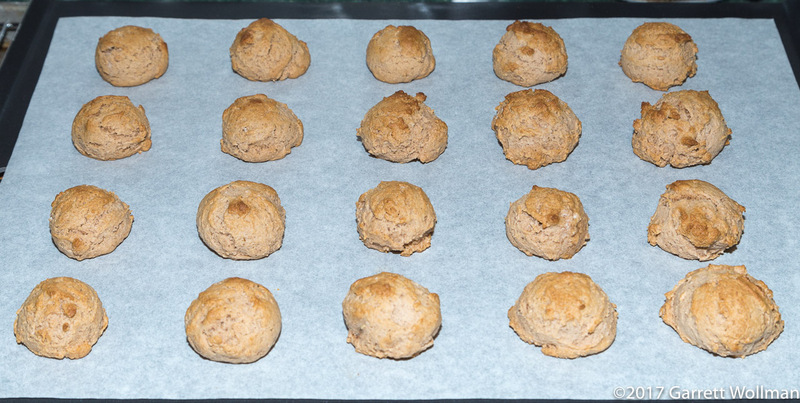 The recipe is quite simple, and makes far more than is required for one or even two batches of pfeffernüsse: 30 g of ground cinnamon (I used true cinnamon and not cassia), 1½ tbl of ground cloves, 1 tsp of ground allspice, 1 tsp ground cardamom, 1 tsp ground ginger, 1 tsp ground mace (I’ve never seen a recipe use that much mace), and ¾ tsp ground aniseed. That last ingredient was a bit of a challenge to find — it’s one of those spices that isn’t stocked in my local Whole Foods, but luckily the conventional supermarket nearby does have it (it still took a bit of searching the shelves) so I didn’t have to mail-order. All these spices are simply mixed well and sealed up in a container. Now for the pfeffernüsse proper, starting with the usual mise en place. Starting from bottom left, you can see the lebkuchengewürz, of which this recipe uses only two teaspoons. Next to that is ⅛ tsp of freshly ground white pepper, and then a teaspoon of ammonium carbonate (next to the bottle). 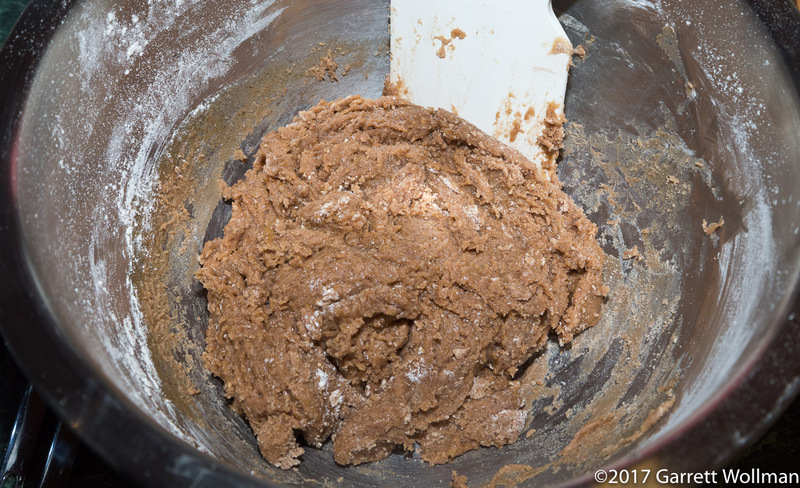 The dry ingredients — 310 g flour, 1 tsp cocoa powder, and ¼ tsp salt, have already been mixed together. In the saucepan at upper right is 160 g of honey and 75 g of sugar, and hiding behind the pan is a single egg. There should have been 1 tablespoon of slightly warmed rum in that bowl in the center, but I mistakenly used my half-tablespoon measure instead. Oops. 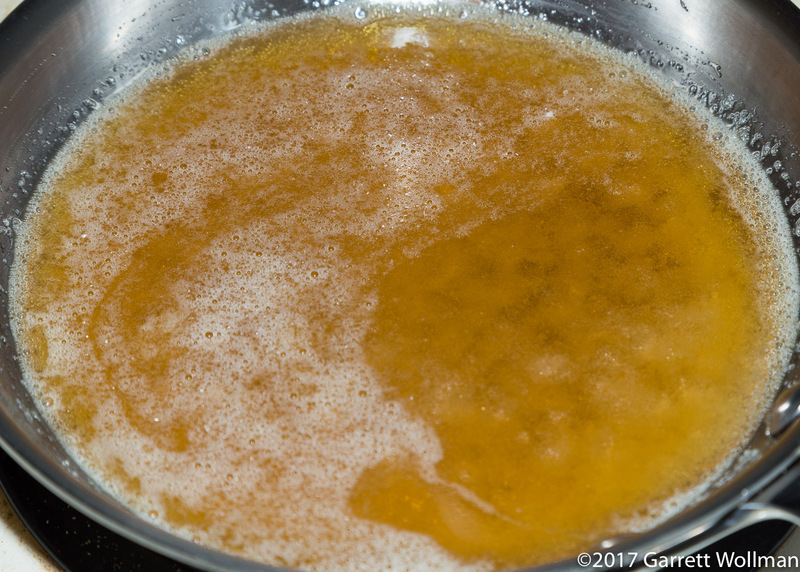 The recipe begins with heating the honey-sugar mixture on the stovetop until it’s hot enough to fully dissolve the sugar. While the mixture is still hot, the spices are stirred into it (this helps to “bloom” the spices and bring out their volatile flavors). Meanwhile, the ammonium carbonate is mixed with the rum, causing it to fizz a bit, and hopefully dissolve. (I found that even when I used the correct amount of rum, it wasn’t quite enough to fully dissolve the ammonium carbonate.) It will fizz quite a bit, losing some of the leavening power in the process (since there’s nothing to capture the gas at this point). Ammonium carbonate — (NH4)2CO3 — was once a popular leavening agent, since it decomposes entirely into gas (ammonia, carbon dioxide, and water) leaving nothing behind, unlike baking powder, which adds sodium or other metal ions like aluminum depending on the specific chemistry. The downside of ammonium carbonate is that half of the leavening power comes from gaseous ammonia, which is not a scent you want to have in your food, so it’s only usable in applications where you can be sure that all the ammonia will be driven off in the baking process. 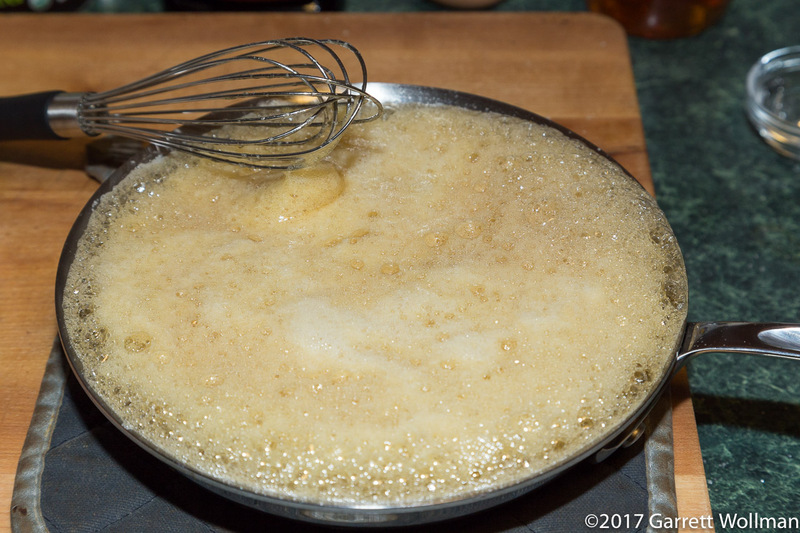 When the rum-leavening mixture is added to the still-warm honey-sugar-spice mixture, a great deal more gas is evolved, giving the baker a strong whiff of ammonia. 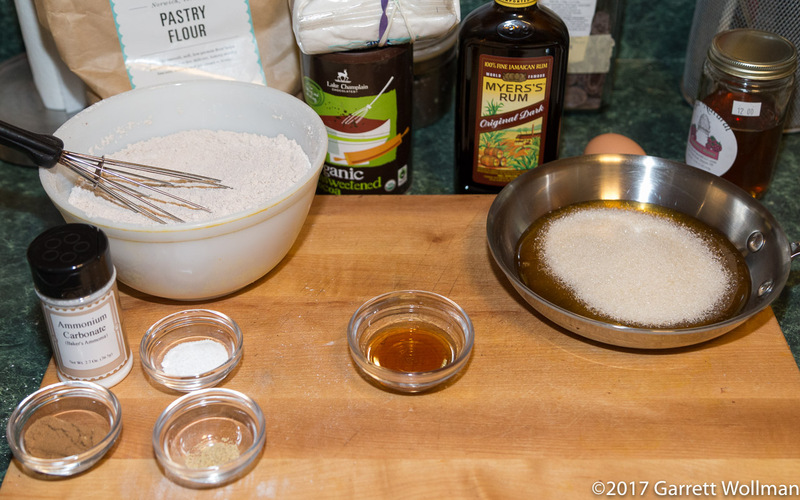 After stirring to fully incorporate, the resulting mixture is stirred or kneaded into the dry ingredients along with the egg to form a sticky dough. At this point, the dough is formed into small balls and deposited on parchment-lined baking sheets. 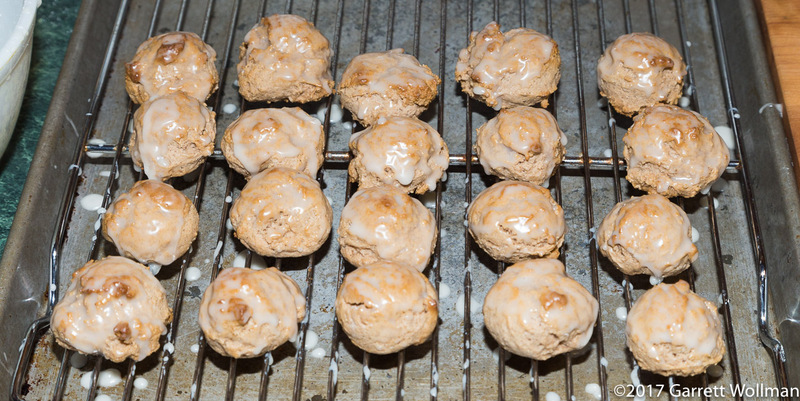 Weiss calls for one-inch (25 mm) dough balls, for a yield of 48 cookies; when I used a #100 (⅝ oz) disher, I only got 31 — I was so surprised by this that I actually did the entire recipe a second time, and had the exact same yield. 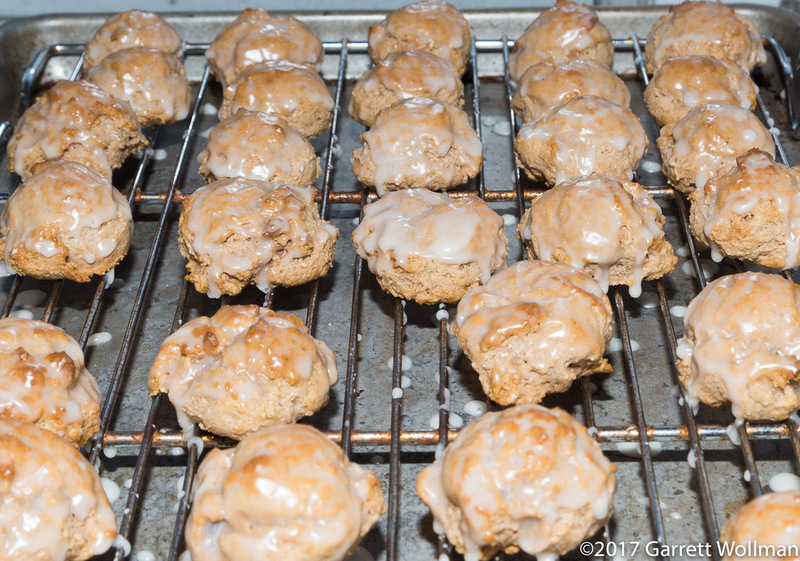 Because there’s no fat in this recipe, the cookies do not spread in baking, and they can be spaced quite close — I had no trouble putting 20 dough balls on a standard cookie sheet, and if you manage to get the 48 that Weiss calls for, there’s no reason you couldn’t fit them all on two baking sheets. The pfeffernüsse are baked in a 375°F (190°C) oven for ten minutes — since there’s very little moisture in them to start with, it doesn’t take long, and you definitely don’t want them to completely dry out. While the first batch is baking, a simple lemon-sugar glaze is made from 100 g confectioner’s sugar, 1 tbl fresh lemon juice, and 1 tbl water. Using a pastry brush, the glaze is applied to the the cookies while they are still hot. Just to keep the kitchen clean it helps to put the cooling rack over a sheet pan to catch the excess glaze. You should probably do a better job than I did of evenly covering the surface of the cookies. Once cool, the pfeffernüsse should be sealed in an airtight for a minimum of several days to ripen — as the moisture from the glaze is absorbed by the cookies proper, the dry, crisp crumb becomes soft and chewy. As I mentioned above, I ended up making two batches of these cookies, which left me with enough to half-fill a Christmas cookie tin that I already had. I had enough (about 60) to eat quite a few of them myself, give a lot away at the family Christmas party, give more away at Christmas dinner, and still bring a dozen into the office after Christmas where almost nobody was around to keep me from eating the rest. The nutrition details below reflect my yield for this recipe and not Weiss’s. If you can actually get four dozen pfeffernüsse, you’ll have to cut these numbers by about a third. This entry was posted in Food and tagged Christmas, cookies, Luisa Weiss, recipe. Bookmark the permalink.